Photograph collection of webmaster. My backyard - the four-track mainline as it passes by Duffield church and its very useful footbridge. D7645 heads north, date unknown. Rationalisation has not yet reached here, semaphores and four tracks will remain for a while longer. The Up slow at this point will one day become the location of a long test section of concrete slab track - with the Up fast suitably slewed onto the formation to test it out. The twelve year three month career of D7645/25295 began with about a year allocated to Sheffield area depots followed by the the remainder of its time allocated to London Midland depots. Built: Beyer Peacock, Manchester, No.8055. Time between withdrawal & scrapping: 40 months. December 1966 to Staveley (Barrow Hill) (41E). 25295 was the 22nd Class 25 to be withdrawn. 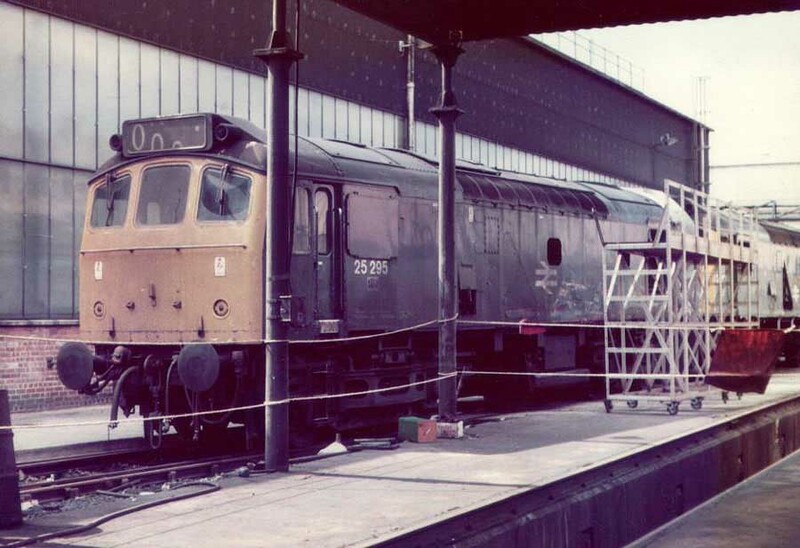 After withdrawal 25295 had reached Derby Works by July 1978. It would be scrapped here by the end of October 1981. Noted Crewe Works April 1969. Noted Crewe Works February 1974. Condition new: two-tone green with small yellow warning panels, straight sided sandboxes, three-rung bogie mounted footsteps, blanking plates fitted, hand/footholds present. D7645 was one of thirty six (D7624 - D7659) Class 25's built at the Manchester Works of Beyer Peacock Ltd. 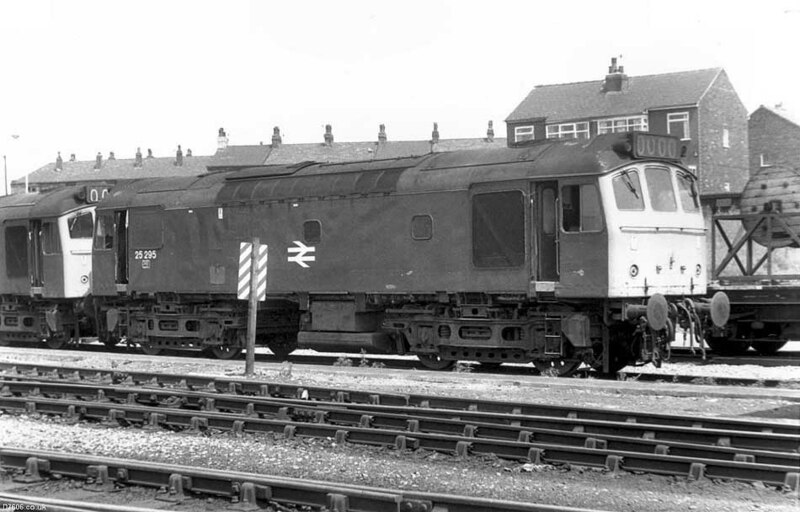 It would be one of twenty five Class 25's delivered to Tinsley (D7624 - D7649), possibly to allow the Class 25's to be used on inter-regional freights for those drivers not having traction knowledge on Class 31/37's? D7645 would be outshopped during March. On August 20th D7645 worked the 09.28 Sheffield - Llandudno Town and the return 14.28 Llandudno Town - Sheffield. To the Manchester Division (D09) during January. At Derby Works during December, possibly during this repair it received dual braking equipment. At Derby Works during January. Ascot Week saw a number of specials arriving in the hands of Class 47's, however two from Manchester Piccadilly received Class 25's between Willesden and Ascot, 7523 & 7530 on June 20th and 7645 & 7662 on June 21st. Transferred to Cricklewood during January. At Crewe Works during February. And back to the London Division (D01) during March. On June 1st the 1Z78 Marylebone - Shrewsbury day excursion utilised 25295 & 25205. The 06.00am Nottingham - Lincoln parcels was worked by 25295 on January 29th. On August 29th 25295 came to the rescue of two Midland mainline expresses. The 08.55 Derby - St. Pancras required assistance between Flitwick & St. Pancras after 45128 failed with a traction motor flashover. Later that afternoon 25295 & 25313 assisted the 15.05 St. Pancras - Sheffield between Bedford & Nottingham after 45114 failed and was removed. Photograph courtesy Ian Hammond. An undated view of 25295 at Springs Branch, the paint job suggesting that its last Works visit was to Crewe. 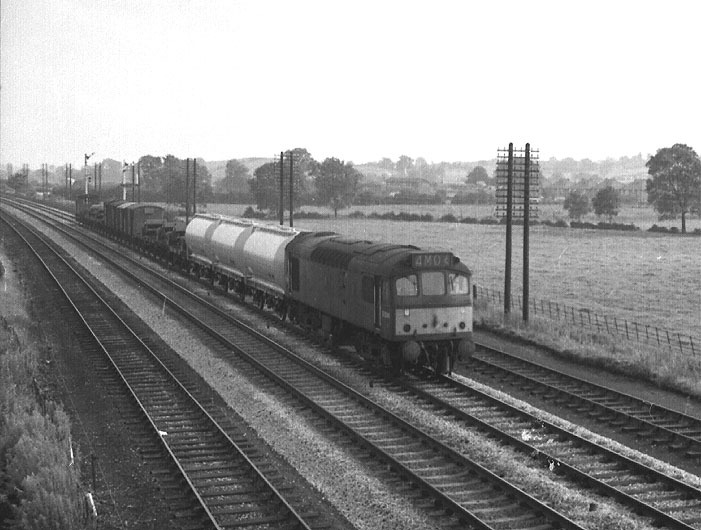 On a gloomy March 31st 25295 & 25294 were noted southbound through Leamington Spa with loaded bogie steel wagons. During June 25295 was active on several passenger duties. On June 7th the Euston - Aberystwyth LNER Society's "The Mid-Walesman" was worked forward from Wolverhampton to Aberystwyth and return by 25295 & 25275. And on June 25th 25295 & 25291 worked the 10.00am Aberystwyth - Euston as far as Shrewsbury. 25295 was withdrawn with collision damage during June and was quickly moved to Derby Works. Photograph courtesy Graham Turner. Its June 11th 1978 and 25295 has just arrived in Derby Works, the rear cab is still sheeted over. One of the first tasks will be to de-fuel the locomotive. Photograph courtesy Martin Bray. 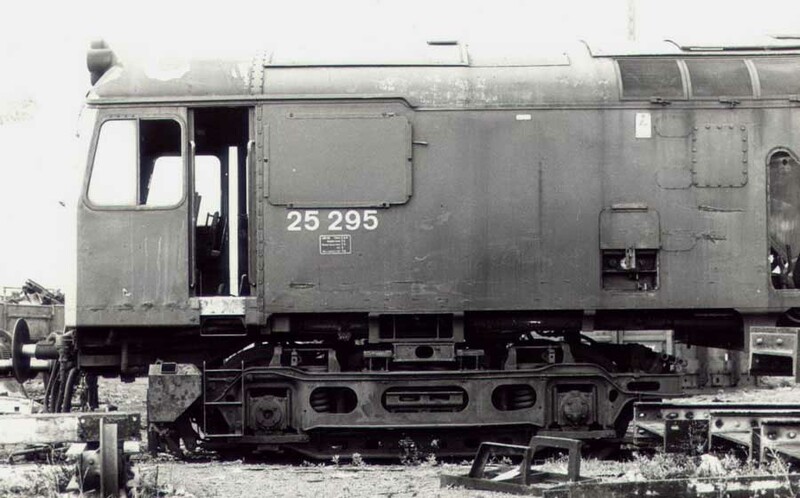 Derby Works Open Day September 1st 1979 and 25295 is visible to all, and definately looking a bit the worse for wear. Photograph courtesy Graham Turner. A close up of 25295 at Derby on October 7th 1979. 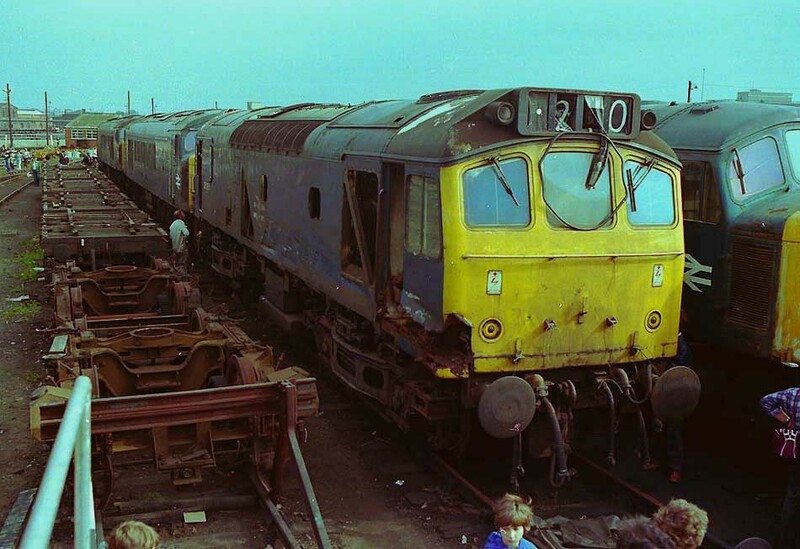 At the beginning of August Swindon contained thirty nine Class 25s whilst Derby Works finally broke up the remains of 25295 which had been withdrawn back in June 1978, the honour of being the longest withdrawn Class 25 now passed to 25092, retired in May 1980 and also at Derby. Page added January 6th 2005.